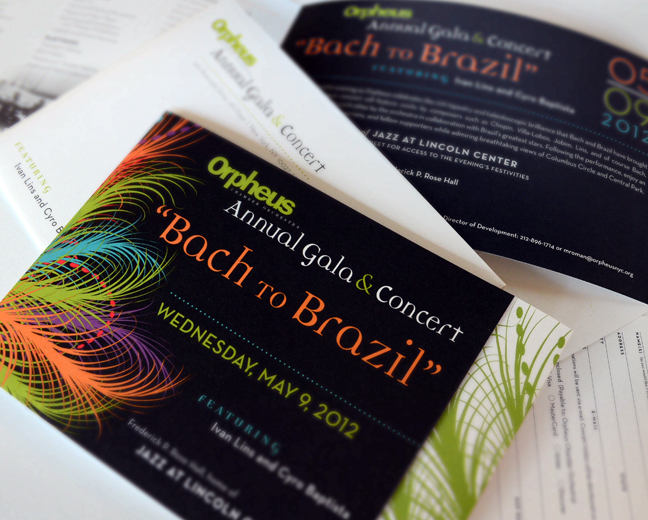 Barbour Design recently completed an elegant invitation for Orpheus Chamber Orchestra’s 2012 Gala. The event theme, “Bach to Brazil,” was reflected in the invitation’s tropic-inspired design and prismatic Orpheus color palette. Materials designed included a save-the-date postcard, invitation, reply card, note cards and envelopes. Printing all the materials on Neenah Flash White added an extra touch of sparkle to the vibrant design.